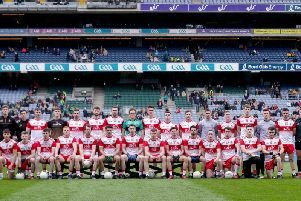 Tyrone U21s, with a lot of high-profile ex-county men at the helm, are quietly going about their business in the early stages of their season. Whilst the county seniors take a momentary break from action, U21s continue to prepare for their season by participating in the Shamrock Cup. The competition is hosted by Cremartin club in Monaghan, as a series of challenge games between Tyrone, Monaghan, Antrim and Louth. Though essentially a warm up competition for the Championship, Tyrone have set out good early season form with two wins out of two, over the Saffron and Farney counties. Team manager Feargal Logan welcomes the competition as an important part of the preparation for the Ulster U21 championship clash with Fermanagh at Healy Park on 18th March. Developing the 18-21 year olds can be tricky. The transition years from youth to adulthood is important in football indeed all walks of life” says ex-county midfielder Logan. Logan is assisted by a wealth of knowledge and experience in his backroom, notably in Tyrone legends Peter Canavan, Brian Dooher and John Devine, among others. Stewartstown clubman Logan also welcomes the expertise of county senior trainer Peter Donnelly.He was instrumental in Cavan’s dominance at U21 level in the past few years, the Breffni county winning four Ulster titles in a row. Now the Coalisland Fianna clubman is back in his native county working as a coach for the Mickey Harte’s senior side, he has been lending his knowledge to the u21s also.